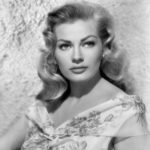 Anita Ekberg was a Swedish actress in American and European films. She is best known for her role as Sylvia in the Federico Fellini film La Dolce Vita (1960). Ekberg worked primarily in Italy, where she became a permanent resident in 1964. "The most important thing for a good marriage is to learn how to argue peaceably." "It was I who made Fellini famous, not the other way around."